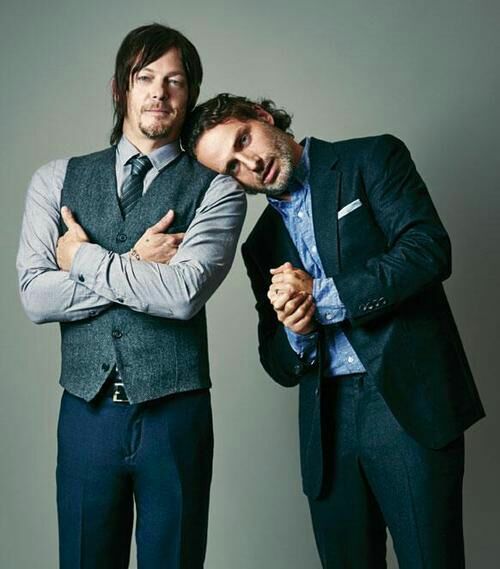 Andrew & Norman ♥. . Wallpaper and background images in the Andrew 링컨 club tagged: andrew lincoln norman reedus photos. This Andrew 링컨 photo contains 신사복, 비즈니스 정장, 잘 입고 사람, 정장, 바지 정장, 잘 차려 입은 사람, 양복, pantsuit, 옷 한 벌, 한 벌, 옷, 양복, and 정장. There might also be pantleg, 팬트 레그, 두 조각, 두 조각 정장, 라운지 정장, 2 피스, 2 피스 슈트, 라운지 슈트, 2 조각, and 핀 스트라이프.